Even though it was written some two millennia ago, Ephesians still speaks to Christians today in themes quite familiar to the modern reader. In a context where the church had become overwhelmingly, if not exclusively, Gentile, the Christian community needed to be reminded of the priority of Israel and the astonishing work of reconciliation that God willed to accomplish in the life, death, and resurrection of Jesus Christ. This volume in the highly acclaimed New Testament Library series reveals the great theological promises of Ephesians while discussing issues of context, authorship, and style. "Reading Stephen Fowl's work is always a wonderful experience. His prose is tight and clear, his thinking fresh, and his commentary on Scripture always targets the sacred text and what it may teach the church about its relationship with God and one another." 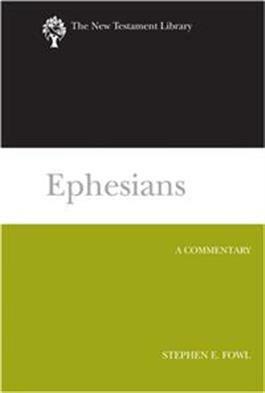 "Stephen Fowl brings his considerable gifts in theological interpretation to the profound theological message of the Letter to the Ephesians. The result is a refreshingly irenic commentary that reflects a thorough knowledge of the critical discussions while eschewing lengthy debate." "Stephen Fowl's rich volume on this rich letter displays his careful reading of the text that yields a truly theological commentary."